Clairee Putnam is a hard worker, a winner and has a tremendously positive attitude - she's an easy kid to root for. The 5-foot-5 combo guard made first team all-state in D-II last year, she is on the cusp of scoring 1,000 points and has led Windham to back-to-back Final Four appearances. She has started since day one of her freshman year and has also traveled the country playing against some of the top players in the country for the past 4 years with the NE Crusaders on the AAU circuit. Putnam's hard work has been rewarded, as she has accepted a scholarship offer to play basketball for the Saint Anselm College Hawks in nearby Manchester, NH. It was Putnam's dream to play in the Division II's Northeast-10 Conference, and now she has achieved that goal. "It is actually pretty ironic how it all turned out, because when I first began the recruiting process St. A’s was not even on my list solely due to the fact that it was so close to home" Putnam told the NH Notebook. "I was looking at several other NE-10 schools, and taking tours on tours on tours. But at the beginning of the summer my AAU coaches, specifically Lauren Moore and Maureen LaRoche, mentioned St. A’s and how they thought it might be a great fit and that there were two new coaches taking over the program. I decided that it would be worth it to check it out before crossing it off my list. I was so attracted to the NE-10 conference and mom and I had gone to so many games last season. By the time I visited St. A’s I already had enough experience from looking at other colleges that I formulated somewhat of a checklist in my head. I wanted a great academic school, a competitive basketball program and a strong sense of community. The second I was on campus I fell in love with the beauty and the community feel. After speaking with the coaches, it was just the icing on top of the cake. Head Coach Julie Plant and Assistant Coach Amanda Shannon are extremely well respected and I understood why, right away. They had such passion and a vision for their program and they were clearly able to articulate their expectations. Stepping into a new program, they explained to me that the kids they recruit must be able to step in and be willing to take part in rebuilding a program and a culture for success. I felt that my experience with playing at a completely new high school and working with the coaches and my teammates to basically build a program from nothing prepared me for this situation. Ultimately, by the end of the day I had realized that St. A’s had every single trait that I was looking for. It exceeded my expectations in every way and I knew that it was where I wanted to play. When they offered me, I had no doubt that I would be accepting." Coaches rave about Putnam's ability, both on and off the court. "Clairee is a great basketball player and a great leader" said Mike Collins, who coached Putnam with this Crusaders and recently accepted the Bedford girls JV coaching position. "She is vocal, positive, and an incredibly well-rounded young woman. Her strengths on the court are ball-handling skills and the unselfish way she distributes the ball to her teammates. Her assist to turnover ratio is off-the-charts, and this is one of the most important stats for a point guard. She also is an incredibly hard-working player and really 'gets after it' on defense. She is just a person that you know is going to be incredibly successful in her life. She is a giver, not a taker, and people like Clairee make the world a better place. It was a real honor to coach her." Windham High was a brand new school when Putnam came in as a freshman in 2010. Yet they had a tremendous amount of success as a team right away, making the quarterfinals in 2011 where they nearly knocked off eventual undefeated champs Souhegan. Then they made the Final Four each of the past 2 years, with Putnam averaging 18 points per game last season as a junior. "For being such a young program,we are very proud of the successes that we have already had" explained Putnam, who also plays varsity soccer at Windham. "We made it to the quarter finals our first season and the semis my sophomore and junior years. All of the success however, did not come without hard work, dedication and sweat. Early on, head coach Joe Mason set a precedent that hard work was expected 100% of the time and he had no tolerance for trouble or excuses. He constantly says 'Play Hard, Play Smart, Play Together, and Have Fun.' It didn’t matter that in our first season we had no senior class and no playoff experience. He and his coaching staff, which includes Coach Joe Mancinelli and Coach Anne Haky, came prepared every day and they expected the same from every player. He taught us that teams win, rather than individuals, and he established a real foundation and culture of respect for us to build upon. We also have the best staff, student body and fans. The support we receive is outstanding. In return, Coach Joe also realizes that it is important for all of us to reach out and give back. The junior high athletes are invited to practices and many of us work with the town recreation program as well as our summer camp. We are building a tradition for what it means to be a part of the Windham High School Girls Basketball Program and especially what it means to be a Jaguar!" Putnam has had the opportunity to play for many great coaches and alongside some very talented players which has helped get her to where she is now. "When it comes to the teammates and coaches that I have had over the years, I could not have been more fortunate" said Putnam, who plans on studying When I began in third grade, I was able to meet and play alongside my best friend in the entire world, Courtney Walsh. I played with her all throughout elementary and middle school and most of high school, during the AAU seasons. Growing up we always joked about maybe one day playing against each other in college, and now that is going to be reality! From my town, I also grew up with Bernadette Connors who is now going to play for Bates. She was like a big sister to me on and off the basketball court and I am so grateful to have been able to play with her. AAU also allowed me to develop friendships that I know will last a lifetime. There are too many girls to name, but we all really became family. All of my coaches have had an incredible impact on my life. Mike Collins and Maureen LaRoche were my first Crusader coaches and they taught me what it meant to wear a Crusader uniform. Both of them have helped and supported me throughout my college search, and have given me some of the best memories. This past year I had Lauren Moore and Kara Leary as my AAU Coaches. Both of them were teachers as well as coaches. I not only learned to play the game but was challenged to really think the game. They are both so knowledgeable and skillfully share their knowledge. Lauren taught me so much about the game of basketball and developed me into the player I needed to be to get to that next level. Being a division II player herself, she knew exactly what I needed to work on to improve and helped me get there by pushing me at every practice and game. She also went well out of her way to help me out with my college search. One of the most influential and significant coaches that I have had is my high school coach, Joe Mason. My freshman year of high school was also his first year as the varsity basketball coach. From the first day of practice, he had very high expectations for me and every member of the team. I was not treated like a first year freshman. Instead, I like the others was a member of the varsity team and it was a privilege. Representing the team and the school was to be taken seriously.I was expected to perform to the best of my ability on the court and in the classroom. Initially I was a little intimated, but I quickly learned that he had our best interest in mind. He challenged me and pushed me harder than I had ever been challenged before, and coached all of us in a way that we had to work for every compliment, and when we got one, it was sincere. He is known for saying 'Take care of the little things and big things will happen.' and 'Play as One.' He truly believes in the 'team' and every player contributing what they are capable of contributing. To be honest, I think he believed in my ability before I did. Coach Joe was also very active in helping me with the college process as well. Above all, he taught me about how to be a good person on and off the court and that life requires a lot of hard work and that he will be there to support me and each of his players every step of the way. Clearly, Putnam is very appreciative of everything Coach Mason has done for her. And by the same token, Mason feels lucky to have coached a special player like Putnam. "I’ve had the opportunity to work with lots of smart hard working players over the years" said Mason. "Clairee is definitely one of them. She had been one of the pillars of our program. She is always well prepared and ready to make the most of her opportunities. She has been very productive and durable over the past 3 season. She works extreme hard in the class room, on the field and on the court. She is a good role model for the younger student athletic. Clairee is really committed to the success of the team, the program and the culture we are trying to establish. She is an excellent communicator on and off the court. Her teammates and coaches have a lot of respect for her, in terms of her commitment, preparation, work ethic, skills and attitude. She will have continue to doing these things and demonstrate good leadership in order for us to be successful." Putnam started playing basketball at a very early age, and her first coach was her mother Lauri. "Some kids are not always fond of the idea of having a parent as a coach, but I loved it." said Putnam, who is the preseason favorite to be D-II Player of the Year in 2013-2014. "My mom first became my coach when I tried out for the 3-4 grade Windham travel team. From that very first day, she was able to separate the family aspect and treat me just like any other player. This was certainly to my benefit because it taught me that nothing would be handed to me, I had to put in serious work for anything that I wanted. Also, my mom truly built the foundation for my basketball career. She instilled in me many core values that continue to apply to my life today including taking pride in my game, always being a team player, and having a great work ethic which can take you a long way. On the court, she always taught us to focus on defense. One of her famous lines was 'a kid can be an incredible scorer but if they can’t play defense then they aren't helping the team.' I couldn’t be more grateful to have my mom as my coach. Also, even though my Dad wasn't a coach, he has always been there to support me and his positive attitude is contagious." Putnam is best known for her blazing quickness, array of dribble drive moves and strong fundamentals. She can handle the ball or finish equally well with either hand and really understands the game. 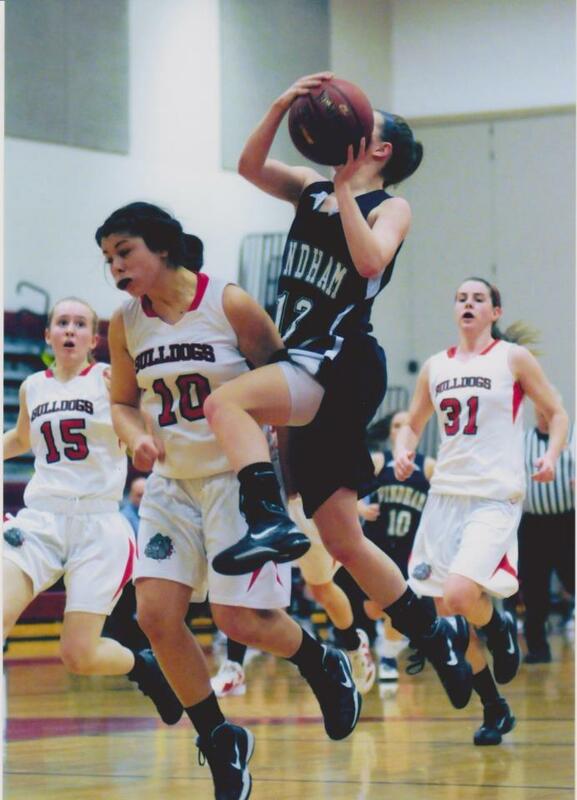 With Windham and on the Crusaders, she has played some point guard as well as some at the 2. That versatility should help her at Saint A's. "To be honest I have never really preferred one over the other" Putnam concluded. "It all really depends on what the team needs and where I would best fit. I have been fortunate enough to get the chance to play both positions and love the different aspects of each position and the job that comes with each. Regarding St. A’s, the coaches recruited me as a combo guard, indicating that I will most likely get the chance to play both. That is something that I am extremely excited about!"